Next month, my dear sweet Rosie will be turning one. So some folks have clearly decided that now is the time to demand to know when I’ll be having more kids. Providing, of course, you leave it at that. Whoa whoa whoa, sunshine. Take a step back. I don’t recall a time when you were put in charge of my reproductive organs. I’m not even entirely sure I’ve got full control of them, and most definitely not at certain times of the month. So… why is this rude? Well, you’re assuming a hell of a lot of things, for a start. You’re assuming I want more kids. You’re assuming my husband wants more kids. You’re assuming we can afford financially to have more kids. Maybe, just maybe, I don’t want anymore kids, for reasons that are none of your business. And maybe you should keep your opinions and your comments to yourself. It’s my uterus, and if I don’t want any more kids I won’t have anymore kids. The moral of the story is, if you’re not in my ‘frequently dialled’, don’t ask personal questions. You might not like the answer. She doesn't want to hear it either. The latest wrap I have been playing with is the new and as yet unreleased Baie Aeolus Shadow. 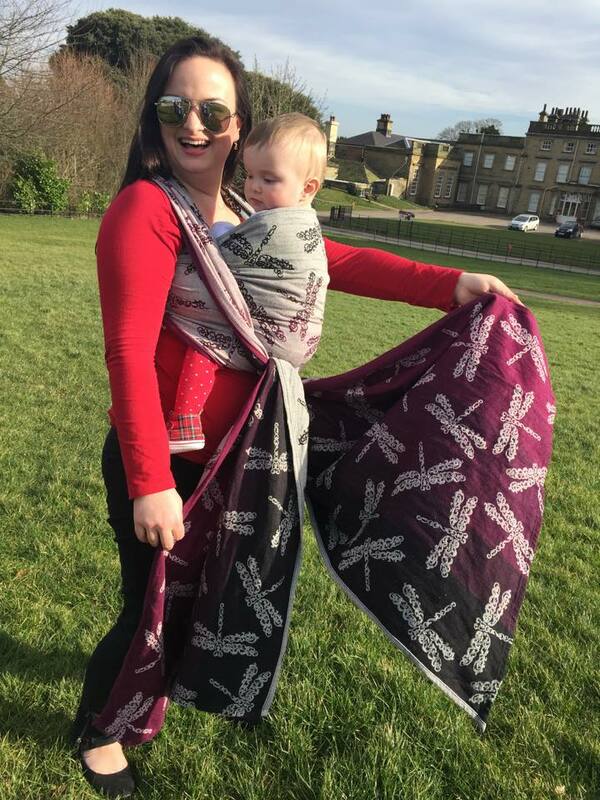 This wrap combines the popular pre existing dragonflies design, and the most recent colourway – a rich plum purple to black gradient. This version is a blend, 79% combed cotton and 21% linen. 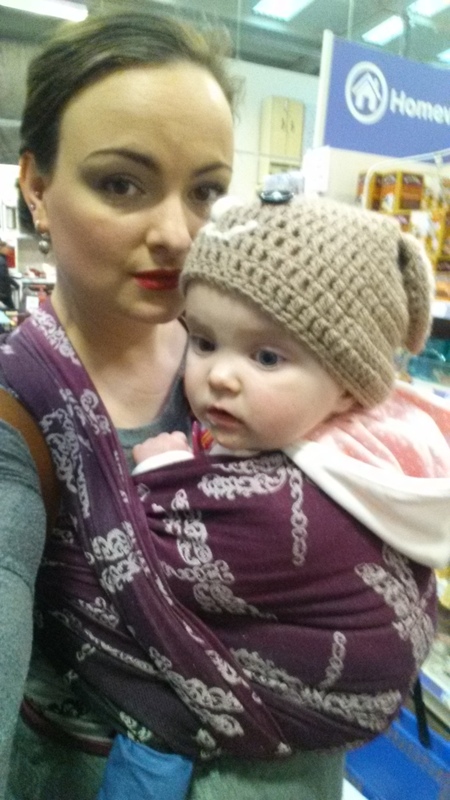 It’s also another snug weave wrap, which is the slightly thicker of the two weaves Baie use. The linen and the weave combine to make this wrap feel quite thick and solid, but not ridiculously so. It’s strong, but I’m not going to have to get out my whip to tame it. For the most part, it felt grippy and supportive. I did however find that the finishing knot in an fwcc needed to be tied double as it had a tendency to slip and work loose – although I didn’t have that issue with the passes. 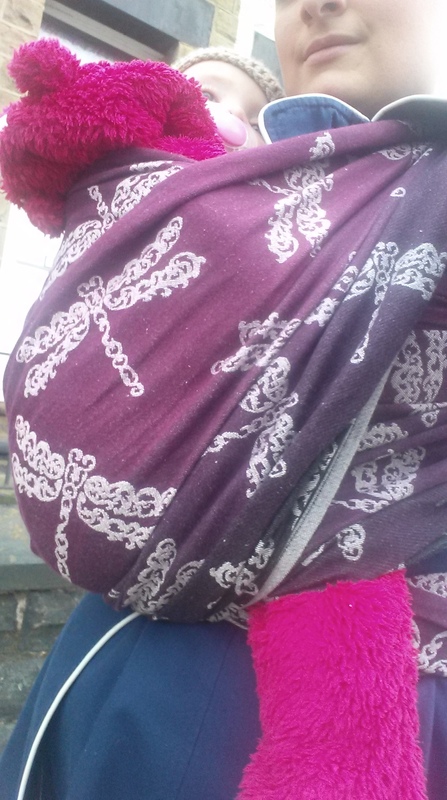 On the darker side of this wrap there is a slight white fluffiness – I find this to be barely noticeable, and Juliette assures me that this is normal. It’s down to the use of natural undyed cotlin, and will disappear with use and washes. This wrap has two very distinct sides. 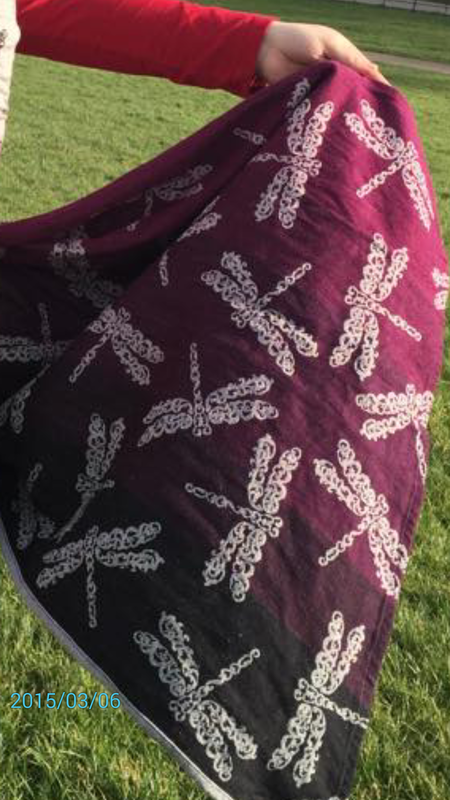 One side has a gradient background with natural undyed dragonflies, and the other has a natural undyed background with gradient dragonflies. Due to the darker colours, the undyed tends to appear pale grey or purple in places. And the contrast is striking! I think I personally prefer the darker side to this wrap, but I do like the fact that it has two separate personalities. 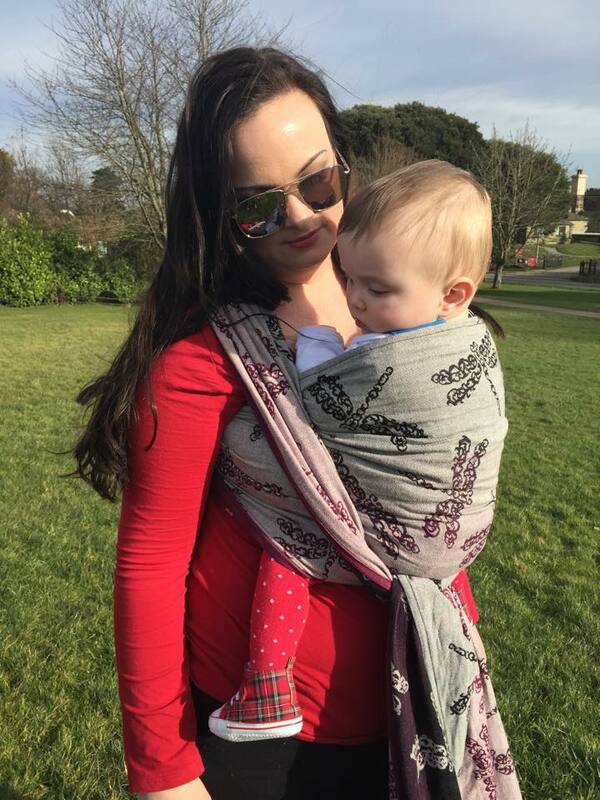 Due to it’s dual personality I feel that this wrap will go with a big variety of clothing, and be suitable for any number of occasions. 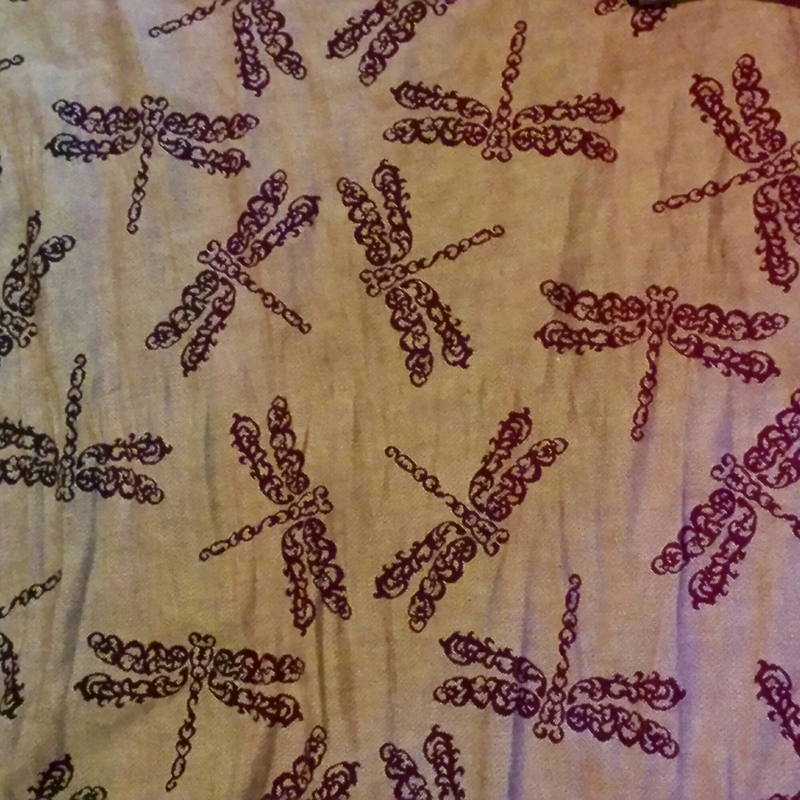 The design, as you now know, is dragonflies. But here is something you didn’t know. Aeolus was designed by Juliette; one half of the Baie team. The pretty, stylised design of the dragonflies is based on the sound holes in an instrument called the English Concertina, which Juliette plays semi professionally. Aeolus is also a God of Wind in Greek mythology, which is rather apt for a dragonfly as they are considered the best fliers in the animal kingdom. 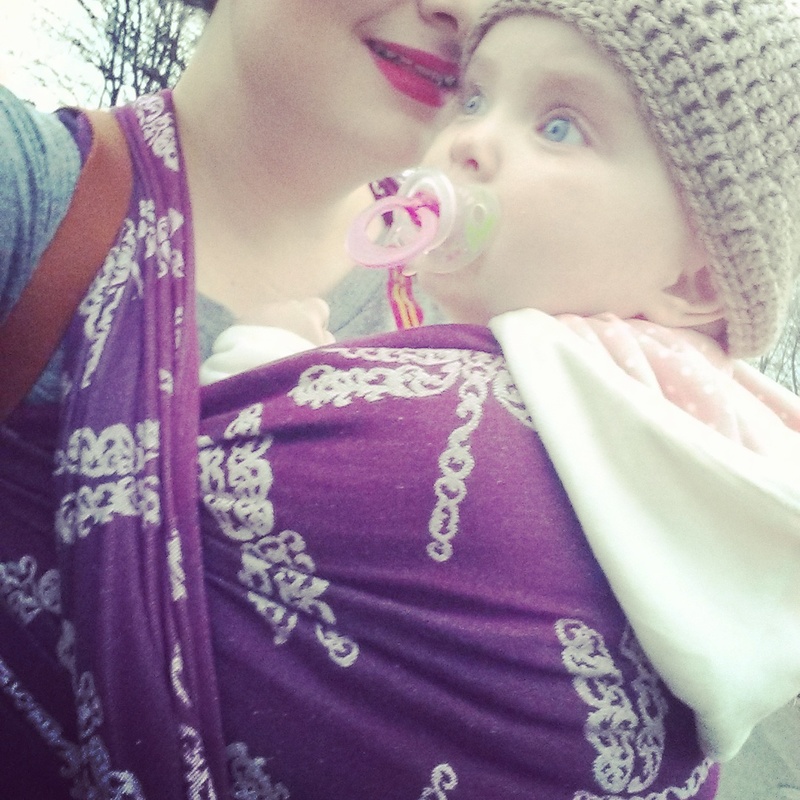 All things considered, this is a strong, capable and versatile wrap that still manages to be pretty. 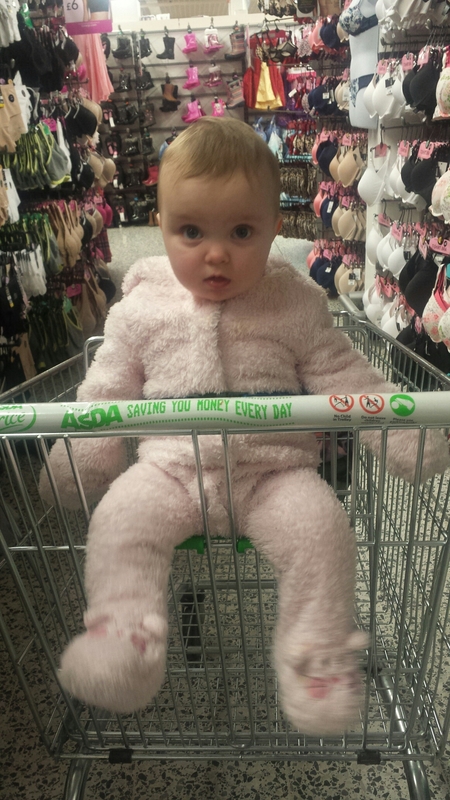 It’s soft enough for little squishes, but strong enough for bigger toddlers. And you can wear it with pretty much anything!